The Scottish Avalanche Information Service (SAIS) publishes its daily avalanche reports via its website www.sais.gov.uk from mid-December through to late March/early April. They also share summaries of these reports via its social media accounts on Facebook and on Twitter which of course you can follow from your own accounts, although we will share these for Lochaber and Glen Coe throughout the winter. On Twitter, the hashtag #saislo will give you the Lochaber forecasts and #saisgl will give you the Glencoe forecast. SAIS also have a YouTube channel with some useful videos. Each avalanche report details the current snow conditions and in conjunction with, amongst other things, the latest weather forecast from the Met Office, a forecast of avalanche risk is generated for the next day. 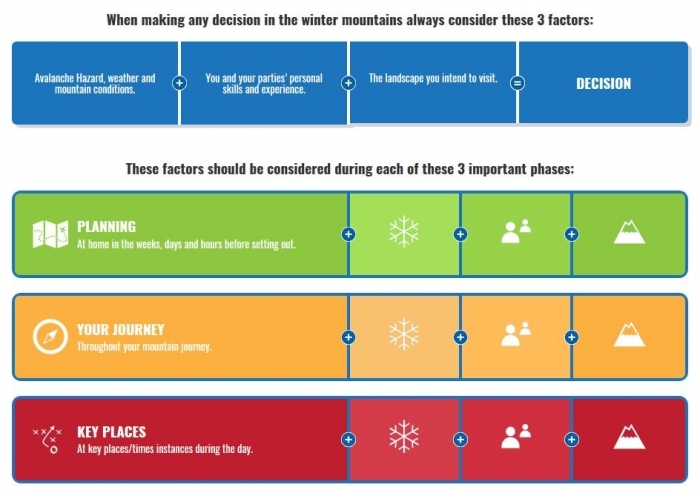 Whilst it is important that you learn how to assess for yourself the avalanche risk of any snow-covered slope that you are on if you are out in the Highlands over the winter, the daily SAIS Avalanche Reports are a valuable resource for planning your day in the mountains. Our Winter Mountaineering Skills course will teach you all you need to know about including avalanche risk in your planning, how to take a snow profile, safe crossing of an avalanche prone slope and winter navigation. Contact us for more information. Up until the 19 March the snow on the mountains had generally been thawing, or to put it another way, the “freezing point” was above the summits. However, overnight the air temperatures were expected to drop markedly with the freezing point expected to lower to about 900m. Generally speaking, this would lead to a stabilisation of the snowpack. However, combined with this freezing were high winds mainly from the southwest which would lead to any new and loose snow being blown onto the newly consolidated snowpack on sheltered “aspects”* of any mountains; in this case north, northwest and east facing aspects. 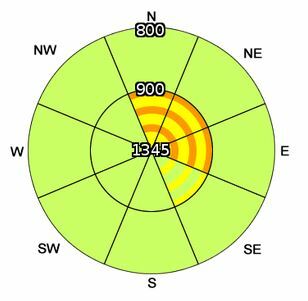 This is termed a “windslab” which, in the areas that it forms, does not provide a stable snowpack and accordingly, the avalanche forecast risk was raised to “considerable” for the following day. So cancel your day out on the hills? Not necessarily! Avalanche safe routes would still be present on the exposed slopes, and even on the sheltered slopes, anything under 900m was unlikely to have frozen. Depending on the steepness of the slope you should be safe from avalanches below say 800m. 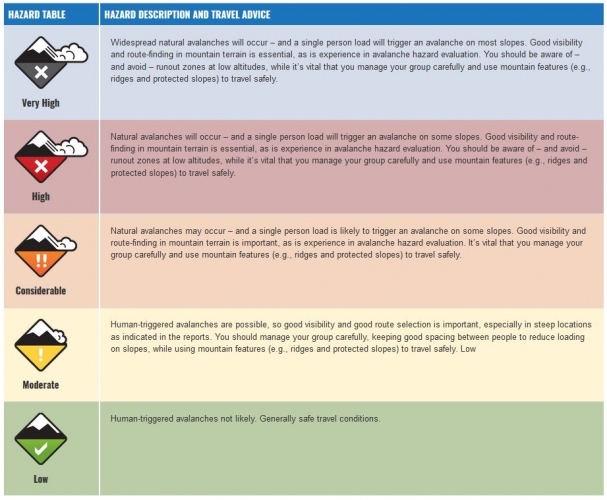 But avalanche danger is only one aspect to consider in your planning. Winds of 40-50 mph on the tops were expected on the 20th March – maybe a day for a low-level route! The number on the outside of the rose is the snowline (or usual access point) in metres. The number on the inner circle shows any transition altitude, in this case, 900m as this is the level to which the freezing point was expected to drop. 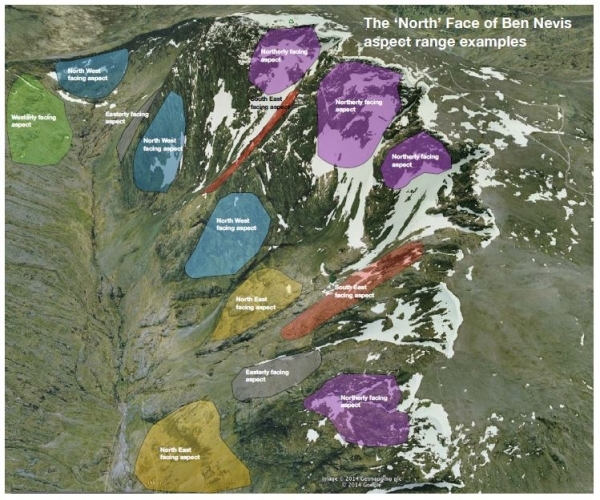 The number at the centre of the rose is the highest point in the area covered by the report, for Lochaber, this is, of course, the top of Ben Nevis. The colours are also important. Green represents a low risk but in this case, on northern, northeastern and eastern aspects the risk is moderate (yellow) with considerable (orange) risk on northern and northeastern aspects (see table below for further explanation). When looking at the SAIS reports you shouldn’t consider the hazard compass rose in isolation, it’s just a visual representation of the report – there may be more details you need to consider.